The award-winning documentary “The Power of Two,” the story of half-Japanese twin sisters Anabel Stenzel and Isabel Stenzel Byrnes, their battle with the fatal genetic disease cystic fibrosis (CF), and their miraculous survival through double lung transplants, premieres on TV and online Wednesday, May 22. The film will air on Link TV satellite network (DIRECTV Channel 375 and DISH Channel 9410) and on KCET (public TV in Southern/Central California) at 8 p.m. It can also be watched online through June 30 at http://bit.ly/pwrtwo. For more information, including other dates/times, go to http://bit.ly/11QpWNF. 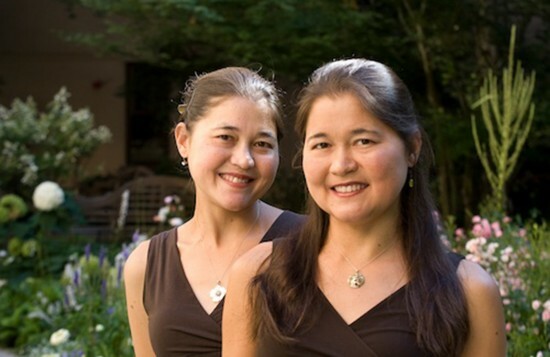 The identical twins were born in Los Angeles in 1972 to Japanese and German immigrant parents. At three days old, Ana and Isa were diagnosed with CF, a fatal genetic disease that impacts the lungs and pancreas. Their doctor told their parents they would be lucky to live to reach 10 years of age. For decades, the sisters struggled to maintain their health with rigorous daily respiratory and digestive treatments. Working together, they survived and thrived into adulthood, graduated from college and graduate school, started careers as a genetic counselor (Ana) and social worker (Isa), and developed loving relationships. In their mid-20s, however, their health began to decline precipitously. Every breath was difficult. Many of the activities they loved, including hiking and traveling, tried the limits of their stamina. Their passion and will to live remained but CF was relentless. There is no cure for CF. But in their darkest hour, when their ability to breathe was leaving them, the twins received the gift of new life and new breath in the form of double lung transplants in 2000 and 2004, respectively. Because of the generosity of their organ donors and their donors’ families, they have survived and are thriving with their new lungs. Their post-transplant activities have included running a half-marathon, climbing a 10,000-foot mountain peak, swimming and running in the U.S. Transplant Games, traveling across three continents, and writing their memoir, “The Power of Two: A Twin Triumph Over Cystic Fibrosis,” which the University of Missouri Press published in late 2007. Inspired by their book, the documentary offers an intimate portrayal of the bond between sisters who, defying all odds, have emerged as authors, athletes and global advocates for organ donation. Their connection to the CF and transplant communities provides rare insight into the struggles — and overlooked joys — of chronic illness. The twins would have been unlikely to receive new lungs in their mother’s native country, Japan, where organ donation rates are strikingly low. At the crux of a rising movement to change laws and stigmas, the two embarked on a tour of Japan to inspire change in the hearts and minds of a culture resistant to transplantation. Featuring archival footage and probing expert interviews, this directorial debut of Academy Award-nominated producer Marc Smolowitz (“The Weather Underground”) presents a multi-faceted portrayal of a society at a tipping point around this triumph of modern medicine. In a recent blog, Anabel Stenzel wrote, “My sister Isa and I had the privilege of meeting with the directors and producers of Link TV to film several PSAs and interviews in preparation for the television premiere of our documentary film … On a foggy San Francisco morning, Isabel and I carpooled up to the Link TV studio to prepare for our interviews. “A make-up artist met us and was able to work miracles with my face, which is ravaged by chemotherapy. We met Thuy Vu, a well-known newscaster who would be facilitating our interviews on camera. “Through our connections, we were able to also invite several others from the transplant community who would offer valuable insight into the breadth of experiences that the gift of life can provide. Anna Modlin, our co-star in the film, was interviewed and shared how far she has come since recovering from her transplant over two years ago. “Sydney Altano, the mother of the late 23-year-old Gianna Altano, spoke of losing her daughter just six weeks earlier. Gianna had cystic fibrosis and was waiting for a life-saving lung transplant. Due to the lack of donors, she died before an organ was found. When the Altano family was told that death was near, Gianna made the decision to become a tissue and organ donor herself through donation-after-cardiac-death (DCD). She also donated her long beautiful brown hair to Locks For Love, which makes wigs for cancer patients. “Up to her last labored breath, Gianna selflessly gave; through her act of giving she continues to be a role model and hero for many. Sydney courageously shared Gianna’s story in front of the camera. We are so grateful for her advocacy efforts for organ donation, even if Gianna was not fortunate enough to receive one. “Link TV also interviewed Catherine Lan Tran, a wonderful Vietnamese American donor family member. She lost both her son and her husband in two separate accidents and both times, she consented to donation, saving dozens of lives. Today, Ms. Tran is an advocate for organ donation, speaking to Asian American communities nationally. “Lastly, Cathy Olmo, director of community affairs at the California Transplant Donor Network, was interviewed. Cathy’s 26-year-old daughter had a liver transplant at the age of two, and is still doing well decades later. As a result, Cathy has dedicated her life to the cause of organ and tissue donation. “We hope that by showing the audience a number of faces touched by organ donation and transplantation, we can demonstrate that our story is the story of many. All of us share a common gratitude for life, a respect for our donors and a celebration of every day that life has to offer. The donation process takes a village; we all support and learn from one another. “Though I do not know who my second donor is, I look at Sydney and Catherine as my surrogate donor mothers, and thank them with as much love and respect I can give. These are individuals who have faced immense pain and loss, yet still thought of others in the midst of crisis. We hope that the interviews, which will be shown between segments of our film, will elucidate to the audience the diverse community touched by organ donation.